I would like to announce the availability of second edition of the ‘Microguide to BPMN 2.0’. Of the many books available on BPMN, this is to first to enter its second edition in a new and enhanced form. A new era for process modeling has arisen and in our second edition, we continue with the most concise coverage of BPMN available. We cover more ‘real-life’ business scenarios and model more unstructured, monitored and indefinite activities in BPM. The text not only corporates new metaphors of events and decision-directed event processing, it also covers 15 different BPM design patterns, forged in the furnace of practical, state-of-the-art process modeling, that provide a shortcut to a proven design. The material in this comprehensive, focused book has been gleaned from actual practices and proven in many of the most advanced processes in production today. In concise language, we explain how to build visible, agile and powerful process that meet the needs of a chaotic and globally federated environment. It truly is an essential resource on the practical application of event, decision and process modeling. This is my forth book project, and a few years ago I wrote some words of wisdom on the topic of book writing. If you are thinking about writing a book you might read them here. Over the next months I intend to focus on BPM and BPMN on this Blog. The book is available from amazon at http://tinyurl.com/MicroguideBPMN. I have updated republished this prior post because the points are even more relevant today. Knowledge is the key factor of production for all modern economies. Old economic models held the traditional factors of production were land, labor or capital and these factors fuel business process. Interestingly, Wikipedia’s Business Processes definition includes a reference to Adam Smith’s description of the pin factory, from the 1776 book, “The Wealth of Nations”. Smith’s standard factors of production are still significant. In modern terms, they have become marketing, business delivery, information technology and personnel. Yet individually, or collectively, they do not and cannot explain global growth. The business processes in Smith’s book address microeconomic principles and practices. It was an analogy, or model, for an individual enterprise with its division of labor. The model describes falling cost because of raising scales and managing the classic actors of production, and the pursuit of greater returns. The ‘pin factory’ story describes macroeconomic industry principles and practices using the notion of the “invisible hand of perfect competition”. The hand is a force that leads to new enterprises entering profitable markets and copying other profitable enterprises and their processes. Because of demands on scarce resources, this, supposedly would lead to rising costs . Contradictions arose in the rising cost model in Adam Smith’s Economic model. The model led to the belief that, because of competition, no enterprise in the industry will set and keep their prices and profit margins. The outcome is decreasing profits to all enterprises in a given industry. We know the importance of knowledge in the enterprise has outdated these ideas. Firms still enter profitable markets and copy other profitable enterprises processes, yet they improve the process with a ‘monopolistic’ control of knowledge. In 1990, Paul Romer published ‘Endogenous Technological Change’, which treated “knowledge as an endogenous factor of production”. Romer’s ideas became widely accepted after he and other economists developed a model that includes and represents “existing knowledge” and the “growth of new knowledge” in global and national economic models. These extended, knowledge-focused models show it is usually available “existing knowledge” (either proprietary or nonproprietary) and the “growth of new knowledge” that is responsible for worldwide and local economic growth (GDP). Growth in “proprietary Knowledge” and managing an enterprise with a “monopolistic competitive entity” has been responsible for sustained worldwide economic growth and increasing returns. It is not land, labor or capital or marketing, sales, factories and personnel based on a fixed economic demand. Further, Business Processes built entirely on the backs of obsolete models will not create future economic growth and profits. Economists and business management theorists have recognized this only recently. More subtly, business process built without the benefit of knowledge-based decisions cannot keep their business profitable. Moreover, most processes are unstable and have been constructed with multiple outdated assumptions. This is little comfort for the many firms that seek to preserve the knowledge of the retiring ‘baby-boomer'. Knowledge” and the “creation of new knowledge” in all its domains and forms are the key critical success factors in all modern firms. Knowledge needs to be identified, defined, and incorporated into the decisions that create and maintain agile enterprise structures. In turn, these knowledge-driven business processes produce timely products, services, and profits. In June, 2005, Frank Rhode published an HBR article, 'Little Decision Add Up', that captures the value of decision in profitability. Figure 1.1 graphs the decision yield concept: the value of the decision declines with the frequency of the decision. Small decisions hold the greatest potential for improvement. Infrequent, large-scale decisions include mergers and acquisitions. Small scale, high- value decisions include customer sales and support, employee onboarding and others. Improve the outcome by improving the small-scale decision. Outcome is improved by raising the accuracy. In the decision there is an increasing role of knowledge on the decisions. Almost perfect knowledge is needed to make exceptionally large scale decision on the left and almost pure information makes exceedingly small decisions. 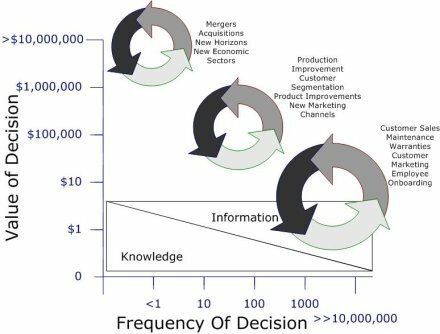 Figure 1.1 This graph depicts the value of frequent decisions and the role of knowledge in these. Figure 1.1 is idealized. Decisions at the frequent, small valued levels often require a burdensome quantity of knowledge from employees. Many processes are not properly digitized and the policies (business rules) are not understood. As firms become more mature in processes and managing decisions less knowledge is needed to make small decisions. Therefore by definition, business agility is a critical metaknowledge framework a process that incorporates a firm’s value creation into a learning framework. For the past 5-6 years, most larger BRMS vendors have offered a Web Version of their Rule Modeling tools. Innovations is finally entering this area with release 5.0. While this is a late entrant in the game, Innovations has taken full advantage of the last ‘adopter’ position. You can see an example of the Web Modeler here. If you do not know, Visual Rules uses a visual approach to modeling Business Rules. A single sequence of shapes on a flow rule, such as the example below, or a decision table is equivalent to multiple lines of code or symbols. The approach is visual; logic is expressed in the notations. Figure: With Visual Rules Web Modeler, you will be able to create visual logic such as this. The Visual Rules Web Modeler places this logic on a Rich-Internet client with drag and drop capabilities and graphical tools. Moreover, it provides enterprise-strength features, such as workflow approval of business rules changes and direct access to business data. This method varies vastly from the Lexical analysis done in the Legacy BRMS systems. They abstract every term in the business rules into a language symbol and separate business data from the rules. This is not only a performance restriction; it impedes agility, which forces the business into useless analysis and reduces flexibility. A compact symbolic or language-based solution for business problems comes at the expense of creating language grammar and symbolic logic. Placing this on the Web does not improve the experience of analysts and managers. On November 11, 2010 my friend and colleague Markus Schartel will be presenting the web modeler in a conference with John Rymer of the Forrester Group. You can register here for that webinar. There is an eighth one, the 'shadowing' process. This is a process for monitoring 'legacy' processes. Dr. Ketabchi A description of each of these processes can be found in this BPM Institute recorded webinar. As the BPM Industry matures, these patterns will emerge. We know from design patterns, that best practices can emerge from the wisdom of experience. External Business Events: EBE's, in combination with business rules, provide channels for messages in BPMN business process. For example, a purchase order has been issued through an X11 file, critical equipment has been recalled by the manufacturer, and sensor data has reached a limit. Internal Business Events: IBE's can arise, from the IT infrastructure and a business process is particularly adept at handling these. IBE's and EBE's form the global cloud of events . IBE's and EBE's can be seen indirectly in the OMG's Business Motivation Model. The OMG's BMM is an essential link between business planning and modeling and business processes management. It utilizes a set of integrated concepts to define the elements of a business plan. These elements support a variety of approaches for creating and maintaining a business motivation model for the enterprise. 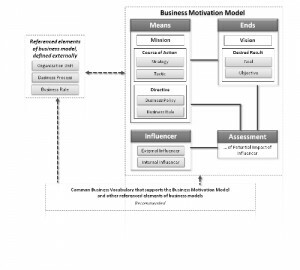 As seen in the figure below, a business motivation model is parameterized in terms of means, ends, influencers, and assessments. It includes reference elements and business vocabulary. BMM is particularly strong where business change drives supporting processes. As its name suggests, motivation is key to the business motivation model and is deeply tied to the mission of the organization. With the BMM you can chart connections between vision and goals and objectives, and link mission into strategy for approaching these goals and tactics for achieving the objectives. IBE's and EBE's arise from the influencers portion of the model. Internal influencers can assessed to be strength or weaknesses and an internal event, such as reaching or missing a key performance indicator, can be one of these. External influences (which are counted as opportunities or threats) are analyzed as parts of the business plan. Obviously, the external events we mentioned above might be an influencer.